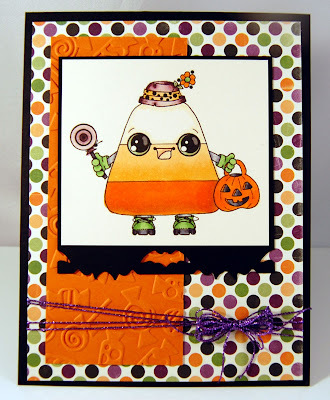 Stamp till U Cramp: Pixie Dust Studio Challenge - "Spooky"
This weeks challenge is "make it spooky". I used the sketch from Mojo Monday 212 for my card. Remember to link your creation to the challenge blog no later then 6pm (GMT) Wednesday, Nov. 2nd! Oh my! That candy corn totally makes me giggle. Such a sweet card. Thanks for playing Mojo Monday! Oh Erin, this is so super cute! I love your colouring and the embossing! Such a cutie!!! Candy corn is a huuuge fave here in my house! Unfortunately, it also makes everyone very hyper, lol!